Snatched a quick day out yesterday, under the cool cloudy skies, and headed for the edge of the Brisbane Ranges, out near Bacchus Marsh. This lovely walk, while short, was so pretty and interesting – and smelt great after all the rainfall of the previous day. 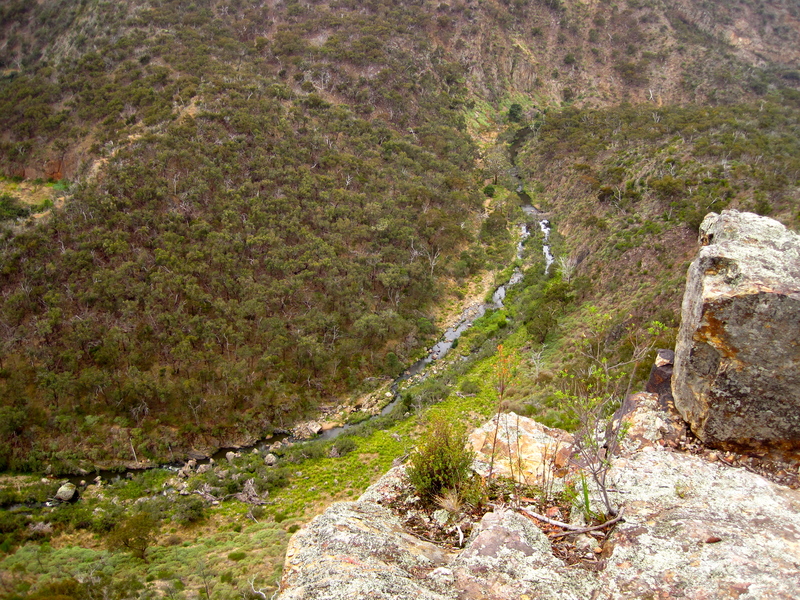 Falcon’s Lookout is reached via some up and down through gullies and easy rock-hopping along Ironbark Gorge – named for all the stunted Ironbark gum trees which grow on the hillside around here. 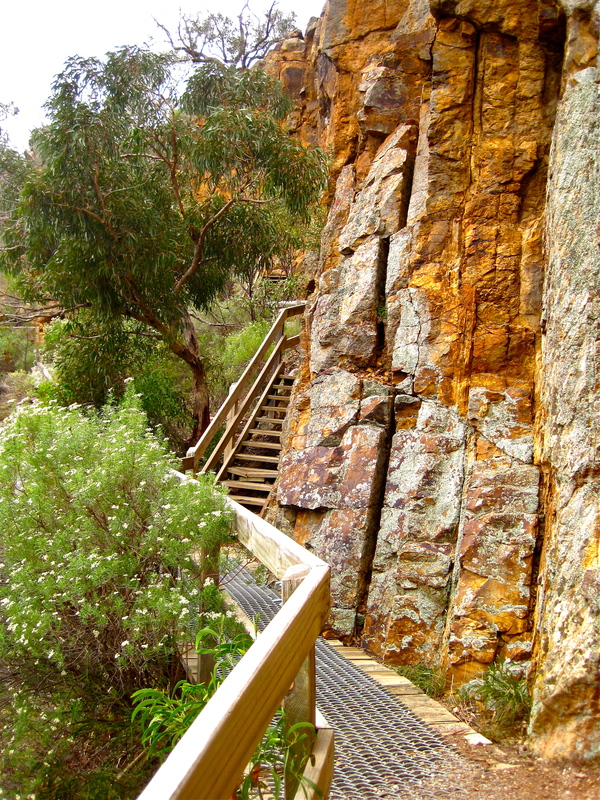 The walk brings you out to the very edge of the red and orange rock cliffs of Falcon’s Lookout, named for the hunting falcons which ride the thermals above the cliffs – though you have a good chance of spotting wedge tailed eagles out here as well. The view down into ice-age, glaciated Werribee Gorge is nothing short of breathtaking, and the opportunity to walk down to the base of the cliffs to watch the rock climbers in action is an additional bonus. Dogs are also welcome in this part of the park, as long as they are on leads, so mighty Indie lead the way, leaping up and over the rocks with abandon while we huffed and puffed behind her! Sure is, Greg – especially as I had only been into Werribee Gorge from the Bacchus Marsh/river end where it is so denuded and glaciated – heaps of times as a kid growing up out near there at Parwan – so I had no idea how wild and wonderful it was the view would be.